Given its abundant resources and huge consumer market, Africa should be taking full advantage of the benefits of regional and global trade. However, African countries are faced with innumerable challenges that suppress their trade potential – not least of which is the fact that the majority of women on the continent do not enjoy the same economic status and opportunities as men, which leaves them economically marginalised and adrift from policymaking processes. These problems were the focus of a workshop held in Johannesburg in December 2016 and co-hosted by the South African Institute of International Affairs (SAIIA) and the University of Adelaide’s Institute for International Trade (IIT) in Australia. With the theme ‘Harnessing Gender for Inclusive Trade’, the workshop provided a platform for trade officials, development specialists, academics and gender activists from several countries to explore why Africa is well behind many other regions in achieving gender equity, how this has impacted countries’ performance, and what steps should be taken to reverse this worrying trend. Female cross-border traders as well as agricultural and garment factory workers were singled out as being particularly vulnerable to bias, harassment and abuse. 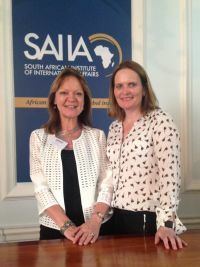 Prof Wilma Viviers and Ms Ali Parry represented TRADE at the workshop, with Ali (a panellist in one of the sessions) speaking about the crucial role played by agriculture in Africa but how a combination of policy failings, poor education and training opportunities, and entrenched biases has made it difficult for women to take advantage of sustainable business opportunities provided by agricultural value chains.